It's with mixed feelings that I write this blog. 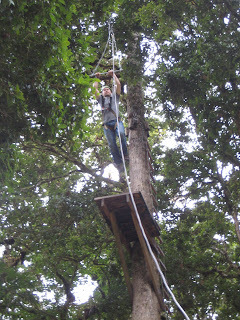 This was our last week in Costa Rica and this morning we had a graduation ceremony at the institute. We've been as busy as always, so I feel as though I've been cruising along the highway at 70mph and suddenly we've slammed on the breaks. Our apartment is basically empty now, all of our bags are packed and piled high... and we drive to the airport tomorrow at 7:30am. And then the next stage of the adventure begins. 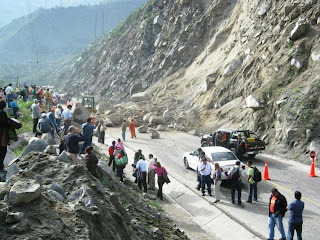 We'll be staying in Quito with our team director, Paul, and his family when we arrive tomorrow. Goal #1 is to buy a car. Once we have a car secured, we head out to El Refugio and will house-sit for the family that lives in the house on the grounds while they spend Christmas in the States-- until about Jan. 15th. Our hope is that we will have a living space (preferably a house) secured by this time. It was hard saying goodbye to friends we've made-- both missionary friends and Costa Rican friends. We may end up seeing some of the students/missionaries again. Most if not all are serving in Latin America, and we'll no doubt be in other countries for conferences or things like that at some point. 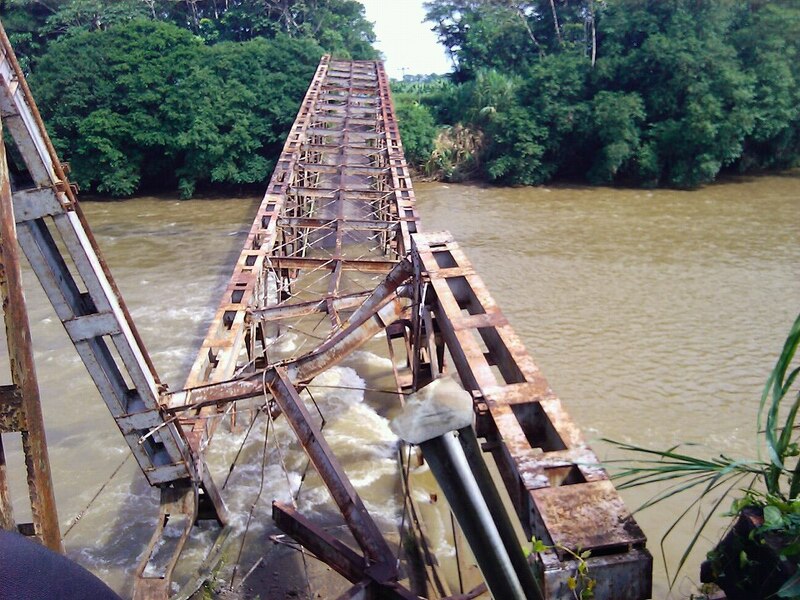 But our tico friends... they'll just be here. It's harder saying those goodbyes, knowing that the only way we'll ever see them again is if we come back to San José, Costa Rica. Please pray for us as we transition into a new culture, as we look for a place to live, and as we spend Christmas away from our families. Happy Thanksgiving from Costa Rica! We've had a crazy, but incredibly enjoyable past 24 hours. Yesterday morning at this time I was just finishing up a written and oral grammar test. Suzy was at the doctor with Kaia for her check-up and a few shots. 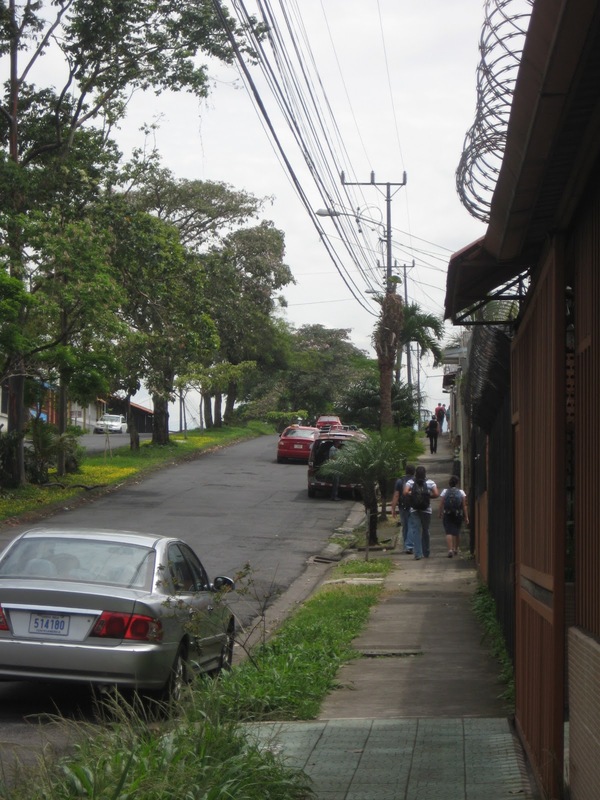 I spent the rest of the morning on my 'route,' talking with Costa Rican men around our community. I came home, ate lunch, and just over an hour later we were heading back to campus to prepare for the Roblealto Christmas party. Roblealto is the name of an orphanage home/community here in Costa Rica. Several families live on a piece of land together and other children who don't have families or homes live with them. 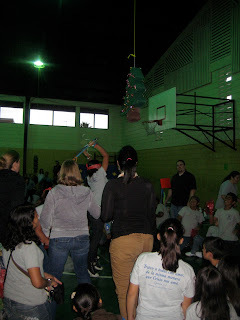 Every year the students at our language school hold a Christmas celebration for all of the kids from Roblealto. There were about 200 people in all from Roblealto in attendance yesterday! In addition to buying each child a Christmas present, we organized a carnival (essentially) with games, face painting, dinner, Bible stories, music, and piñatas! Our family bought gifts for 2 different children-- a board game for one and a soccer jersey of a local team for the other. One thing I noticed as I looked through the Christmas lists of the children was that many of them wanted soccer balls, goalie gloves, soccer shoes, and jerseys of their favorite teams. Soccer is such a huge part of the culture here, it's really pretty incredible! I'm not sure if you can fully grasp just how intertwined soccer is with the culture until you live in a latin american country. I was recruited to paint faces. I sketched about 15 different full-face paint options as well as a few random things I could paint on cheeks or arms. Of course, I included the crests of the two most popular soccer teams. I had no idea just how popular those would be... though I should have anticipated it. Suzy helped to coordinate all of the food for the event. She and 3 other students baked and frosted 200 christmas tree shaped sugar cookies the day before the event and also prepared boxes of food to distribute to each child at the event. Each box included a subway style sandwich, a juice box, chips, and the homemade sugar cookie. And of course, as you can see above, Kaia helped, too! 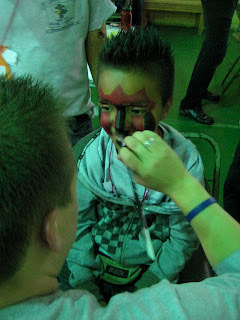 So, the day before Thanksgiving, we held a huge Christmas celebration, and I painted face after face with soccer logos. The cool thing was that after the Roblealto event, I went with a group of students and a couple of Colombians to a soccer game featuring one of the two most-liked soccer teams: La Liga de Alajuela. With tickets only costing $6 a person, it's a great cultural experience-- and it's just really fun, too! It was fun to talk with the boys while painting their faces about the fact that I was a fan of their team, too, and that I'd be going to watch the game in just a few hours. The event went great! The kids loved the games, ate great food and loved opening presents with items they had specifically hoped to receive. And after the event, I joined up with some friends and we took the bus to Alajuela. It was an incredible game and the crowds were alive with excitement! As we're leaving Costa Rica in just over 3 weeks, it will be my last soccer game here, and it was a great one to go out on! La Liga won 2 - 1, and that win put them into first place in the division. Needless to say, the Liga fans were rejoicing! And today is Thaksgiving. We started the day with some banana chocolate-chip pancakes and coffee, watched a Garfield Thanksgiving Special, and have been having skype and facetime conversations with family members all morning. Our power just went out about 5 minutes ago, so unfortunately I doubt I'll get to post this before we leave for our Thanksgiving celebration. We're getting together with 4 other families from the language school and we're all doing our best to create the typical dishes using slightly different products with necessary modifications... but I'm sure all of the food will be wonderful! I any case, It'll be fun to gather with other brothers and sisters in Christ and give thanks for the many blessings Christ has bestowed upon us! So, as we celebrate this Thanksgiving, we are thankful for where God has us in this moment in time. We are thankful for the culture we are in, we are thankful for the culture we've come from, and we're thankful for all of the amazing people in our lives. We're thankful especially for our family and friends who are supporting us in our response to God's call in our lives and are making it possible for us to be where we are. Without all of you, we would not be speaking Spanish as well as we are in this moment, nor would we be about to embark upon a new life in Ecuador in three weeks from now. Therefore: Thank you! Thanks for caring about us, praying for us, and being involved in our lives. 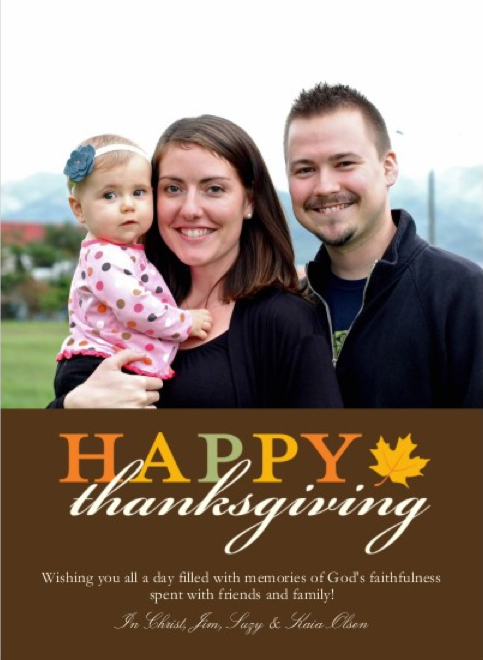 We are so thankful for all of you! May God bless you richly! This week I want to tell y'all about a good friend of ours. Paul Jones is a 36 year old from Ohio. Paul is single and is a pilot. He worked primarily regionally in the East Coast and a bit in the Midwest, but he has also made flights down to Texas and many other locations. He even fixed up a plane that he then flew solo in all the way up to Alaska. When we arrived in the end of April, we had a very small group of incoming students. There were 10 of us total. Four of us were men, and the other 6 women. Jeremy McMillan and I are married and have children, and Tom and Paul were single. Tom was in his 60's and though Paul and he varied quite a bit in age, Paul kind of took Tom under his wing. As the two single men of our class, Paul helped Tom quite a bit in learning/understanding spanish, and they spent quite a bit of time together. I had a few good conversations with Paul last trimester, but as all new students, we spent a lot of time just adjusting to the culture, new language, and routine of daily life. Tom left after one trimester, leaving Paul as the only single guy. Others left, too, leaving our '2nd trimester class' at a grand total of 8 people. Jeremy, the other married guy came in with a decent amount of spanish, so he was placed in a higher language class. So this trimester Paul and I are the only guys in grammar class together. Not to mention that three of the other women exclusively tutor... meaning there are 5 of us taking full-time classes. At any rate, Paul and I have become very close. He's a dear friend, and a true joy to spend time with. He's also a guitarist and singer, so we've had multiple chances to play together and lead worship alongside one another. He's got a heart of gold, and we're excited for the ministry he's going to be doing in Guatemala. Being that he's a pilot, his ministry has to do with flying. He's being sent by a ministry organization called Missionary Air Group (M.A.G.) and will basically be pioneering the ministry in Guatemala. I should mention that Paul worked stateside with a missions organization learning the nuts and bolts mechanics side of airplanes as well. So, not only can he fly the planes, but he's a mechanic and is completely capable of repairing and caring for planes of many varieties. There aren't really any landing strips in Guatemala, and therefore there's not much going for this country in terms of smaller planes being able to transport people for ministry, emergencies, health care, delivery of much needed supplies, etc. So this is where Paul comes in. He will be traveling around Guatemala, building relationships with villages, towns, and individuals to build trust and eventually build landing strips for airplanes. As he develops more and more locations for planes to land and take off, ministry throughout the country will be able to occur faster and when necessary. So, please pray for Paul. He's going to be staying here for another trimester, meaning that he'll be here in Costa Rica through April, roughly. It has been such a blessing both for Suzy and I to have someone that we feel so comfortable with living just down the road. It's also been a huge blessing for me to have someone that I click with in such a strong way as a brother in Christ, but also just as a really strong friend. Whether we want to have brunch with someone, go for a hike, play games, go to a soccer game, or just talk for hours, Paul seems to always be there for me (and for us) and has really been a defining presence in our time here at language school. I should also mention that Paul is an incredible photographer! 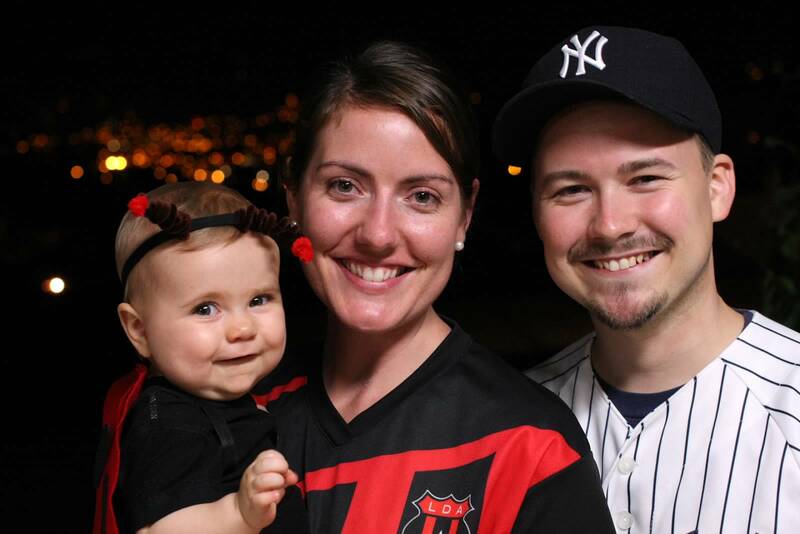 At the school's harvest (halloween) celebration, Paul took pictures all throughout the night, and took this amazing one of our family at the end of the night. Wishing all of you a wonderful start to your week! It has been far too long between blog posts: for that, I apologize. We've had a pretty crazy last couple of weeks. Last week was spiritual emphasis week here at the language institute. They fly a speaker in and we have two sessions every day of the week in addition to our normal classes. Though it's a huge blessing, it also means that Suzy and I have to prepare music for all 10 sessions. Now, we do delegate, so not all of them were led by us-- but I did play and/or sing in 8 of the 10. Not to mention coordinating, making slides, and practicing. The speaker was really solid, it was nice not having any tests, homework, or reports that week, and it was a joy to lead the student body in worship with such frequency, in spite of the time commitment. This past weekend we spent a full day with some Costa Rican friends: a couple from our church and friends of theirs who live in a tiny mountain town nearby. We left first thing in the morning and made a two hour drive east to an outdoor ministry site called La Cumbre. 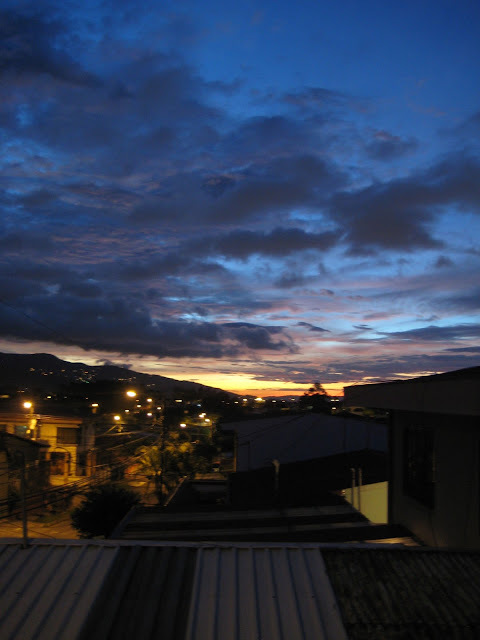 La Cumbre is quite similar in many ways to El Refugio, where we'll be serving in Ecuador. They've got a gorgeous piece of property with a winding river running straight through the middle of the grounds. They have high and low ropes course activities, a soccer field, a covered basketball court/gym, indoor housing for 100 some people, and beautiful common areas. It's a gorgeous place. The reason we went was because the couple from the small mountain town are very involved in a smaller, new church, and they have a desire to see the population of youth grow in the church. 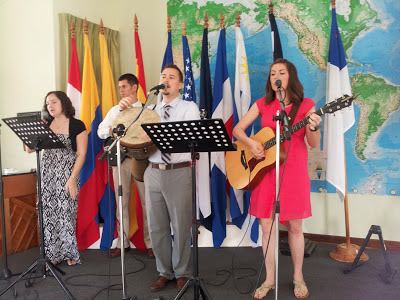 When we first met them, we told them about what we'll be doing in Ecuador, and they loved the sound of it-- they just wished there was something like that here in Costa Rica. We were pleased to tell them about La Cumbre! Though we hadn't been ourselves, we'd heard of it from connections through El Refugio and through the language school here. We had a great time out there being shown the grounds, eating, watching some youth doing activities that they offer, and even participating ourselves! 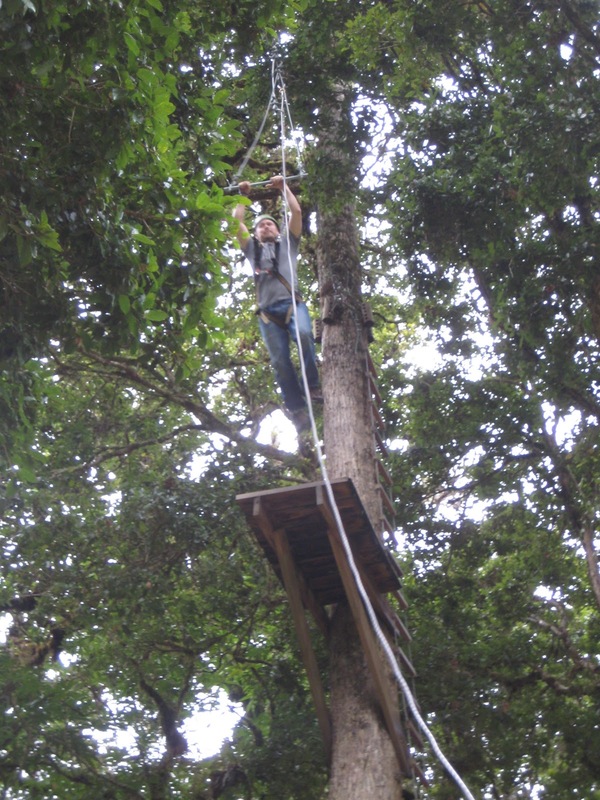 I did a high ropes element called 'The Leap of Faith.' I had to climb up a rope ladder to a platform and once at the top, leap towards a hanging bar. The bar seems just out of reach, and though you're harnessed in and connected to a rope, there's certainly a degree of fear in leaping into thin air, hoping your hands will be able to reach/ grasp the bar in front of you. I won't elaborate on it any more, but the spiritual parallels and implications are numerous. Aside from that, we've continued to teach our weekly Saturday group of youth who are learning to play and lead worship music, I've continued having my weekly conversations with men in the community, and Kaia continues to grow and be sweeter and sweeter every day! Today is Halloween. Hurricane Sandy hit the Eats Coast this week. The presidential election is next week (we sent our absentee ballots in yesterday!). The Yankees aren't in the World Series. Lucasfilm is now owned by Disney. It rains quite hard here just about every day now. Thanksgiving is in 3 weeks and a day. In just over 7 weeks Christmas will be here-- and in just over 6 weeks we'll be flying to Ecuador! Changes, big events, busyness, and much ahead of us. God is good, through it all! Babysitting for other students-- as a result, Kaia gets a play-date with some other girls! When I lived in Ecuador in 2005, I spent most of my 8 months in the kitchen with 4 wonderful women, Maria, Esperanza, Kenya, and Magdalena. They were the cooks for an after school program that was sponsored by Compassion International. The project was located at a church in a poor neighborhood called Carmen Bajo and there about 50-70 elementary school aged kids that participated in the program. Everyday these women would conjure up some of the yummiest food I ever ate while living in Ecuador. I was always amazed by these womens' ability to turn rice and vegetables (occasionally chicken) into a feast. My love for cooking started in that kitchen with those women and I will always be grateful for the time I was able to spend with them. Me with Esperanza and her two daughters back in 2005. This last Sunday I was reminded of many good memories with my Ecuadorian cooking friends because I once again found myself as the student learning from another skilled latina cook. Every week our church here in Costa Rica offers a post-service snack. The food ranges from different typical costa rican dishes to chinese fried rice to tacos (costa rican style), and sometimes even ice cream. Every once in awhile they serve up hot, delicious, freshly made cheese or bean empanadas. 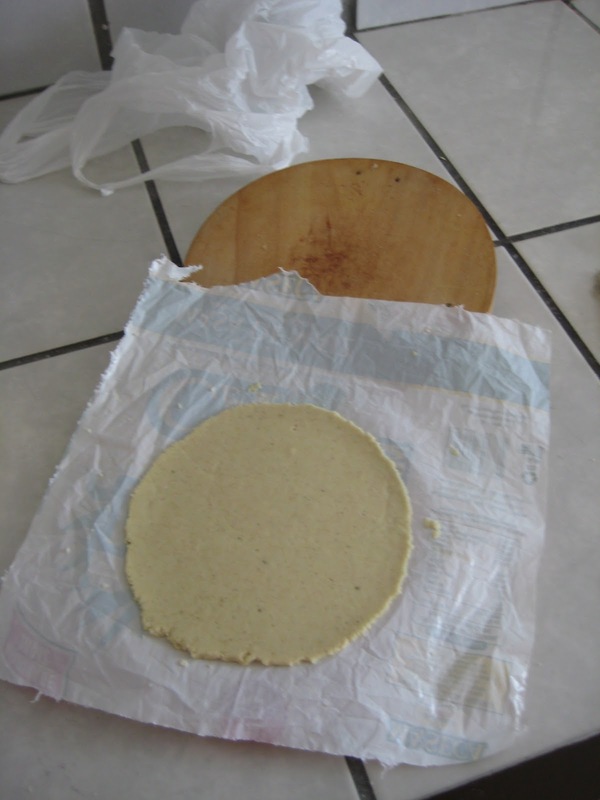 They are very tasty and I had decided that I would love to learn to make them. They may not look like much, but they are packed with flavor!! Two weeks ago I shared this thought with the Pastor's wife at our church and she set me up with Ethel. 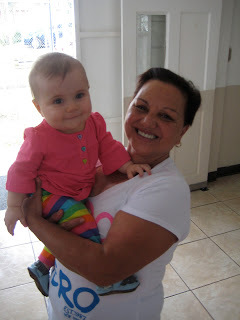 A dear woman who is known as a very good cook within our congregation. 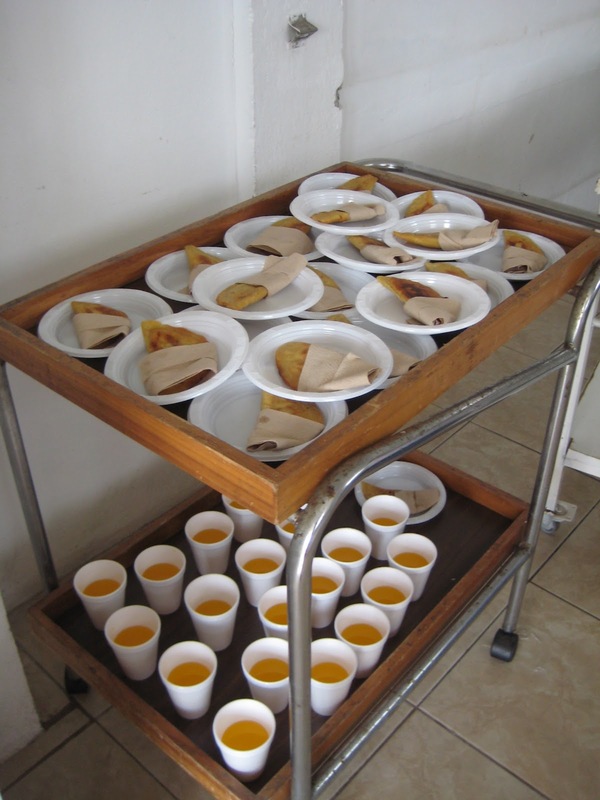 We were put in charge of making the post-service snack and we spent the majority of the church service whipping up these tasty treats and I felt right at home in the kitchen with her. It was so fun to watch her skilled hands work swiftly to make these delicious treats and now I will be able to carry on her legacy even when we move to Ecuador! 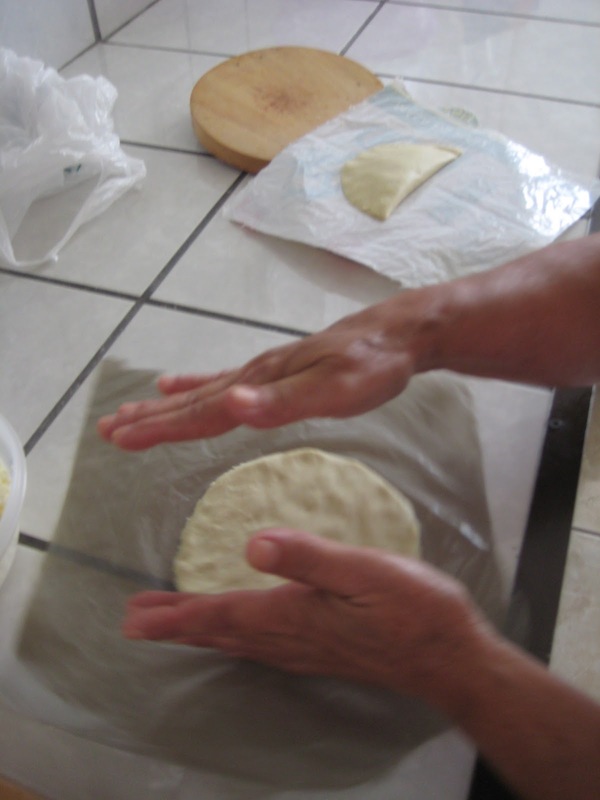 When it comes to any kind of dough, it's especially helpful to have a practiced cook teaching you. Here's the dough ready for making the empanadas. This is genius. Jim and I always wondered how they got their empanadas to be the exact same size! We were convinced they had to be factory made, but they are not. 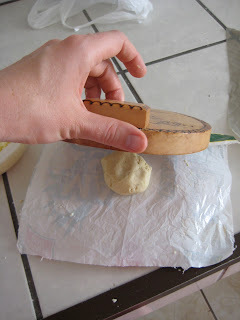 To make the empanada, you take a golf ball size piece of dough and put in this contraption. They come out looking like this every time! fold it over and put it in the fry pan. 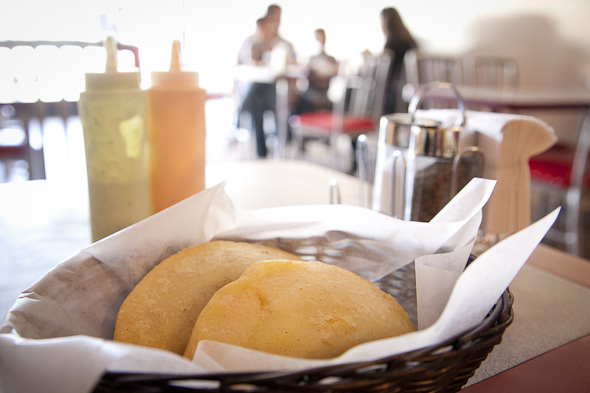 empanada without it. I was blown away by how quickly and evenly she formed that disc. 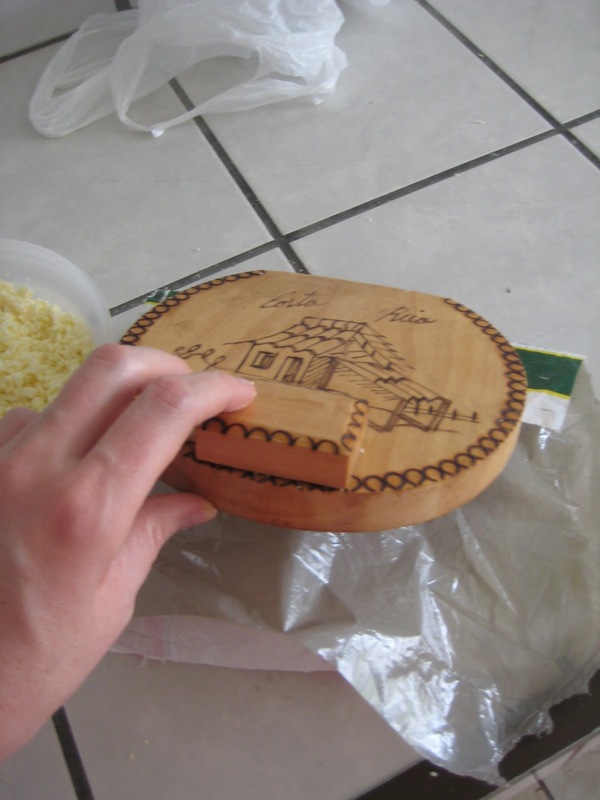 made by the gringa and which were made by Ethel. hungry members of the congregation. I'm sorry I didn't meet Ethel sooner, but I do hope to continue to deepen our relationship over the next ten weeks. 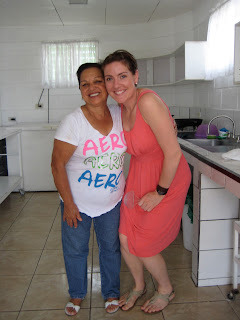 She is such a sweet woman and I look forward to pursuing similar relationships with women in Ecuador, too...ones that will be able to last a long time and build up from the passion for cooking that God has laid on our hearts!! Ethel and I in the kitchen at church... ...and of course, Kaia helped us, too! Today Suzy asked me, "What are we gonna do for Kaia's 1 year old birthday?" It's still a few months away, but it brought my mind zooming to Ecuador. That's only a few months away, too! Having been here in Costa Rica for about 5 months now, it's hard sometimes to remove ourselves from this current existence and imagine what life will be like in December. I will say, doing this FARO program (click here to read more about what that entails) has begun to give me a glimpse into what life may look like in Ecuador. For the past 2 weeks I've literally gone out every day to talk with Costa Ricans. During the week it's with people who live or work in this community, and on the weekends we've spoken with people for hours (literally hours) at church ministry opportunities or with church friends. Its been great! It's draining at times and there are frustrating parts as well, but overall it has been enjoyable just to sit and visit with people. I'm spending quality time with these individuals, building a relationship, and having opportunities to discuss life, culture, and things of importance. This is hopefully what life will look like in Ecuador as well. Another question Suzy brought up today while walking home from church was, "What do you think our home will be like in Ecuador?" It was fun for a minute to daydream about having our own space again-- a permanent space that we can decorate, settle into, and really call 'home!' Again, my mind went zooming to Ecuador... and I realized it's not all that far away. We don't have a 'home' lined up yet, and we'll be arriving in less than three months! A lot of you asked us when we were meeting with you where we planned to live. That hasn't changed-- we plan to live in the town of Calacalí, where El Refugio is located. We want to live among the people we're serving and building relationships with. The one discouraging thing is that Calacalí is a small, rural town, so it may be difficult to find a place to rent. Therefore, will you join us in prayer? We know God goes before us and we trust that He will provide the perfect place for us to live-- but we want to be diligent in praying that the details would all come together and that we would indeed find the most ideal house to call home. Blessings to you this week! May you be encouraged in your faith and filled with the peace of Jesus Christ, our Savior! I have never experienced an earthquake before. Well... maybe I have, but they've never been strong enough for me to feel. Last week we experienced a very strong earthquake here in Costa Rica. It was originally said to be a magnitude of 7.9, but then later declared it to have been a 7.6. Either way, it was very strong and quite noticeable. I was in class when it took place and it was really a bit surreal. I always expected an earthquake to just feel like I was being shaken back and forth, when in reality, it felt more like being on a boat in really rough water. The ground beneath us was moving back and forth, up and down, and everything was just seizing in different directions. It wasn't incredibly strong at first, so we all just looked around for a few seconds before fully realizing what was happening. It continued to grow stronger and stronger, and as it escalated we all made our way out of our seats and outside as quickly as possible. 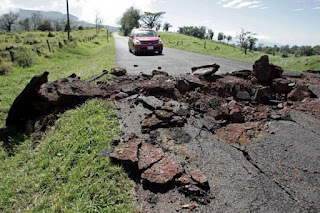 There was a small degree of hysteria, as many people had never experienced an earthquake before and some that had were just very frightened because they don't like them. Many people immediately thought of the safety of their family members and were understandably worked up. Cell phones were quickly seen all around me (those of the Costa Rican teachers in particular) frantically calling their loved ones to be assured of their safety. Though it felt incredibly strong where we were, the epicenter of the earthquake was about 120 miles away from us-- which makes it scary to imagine how it must have felt to those at the center. The school's president was out with all of us and called an impromptu gathering of all the students after the earth stopped shaking. We spent time in prayer together as a student body-- thinking of those who were near the epicenter, or in buildings and locations where significant damage had occurred. 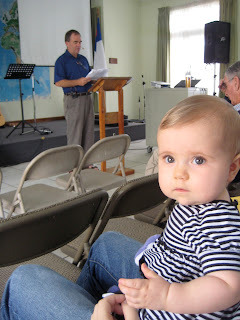 We read portions of scripture together. The staff did a great job of reigning in all of the emotion and excitement and focusing that energy on our hope and trust in Christ, and praying for those who sadly don't have that assurance. Suzy and Kaia were back in our apartment and made it out in a timely fashion as well. 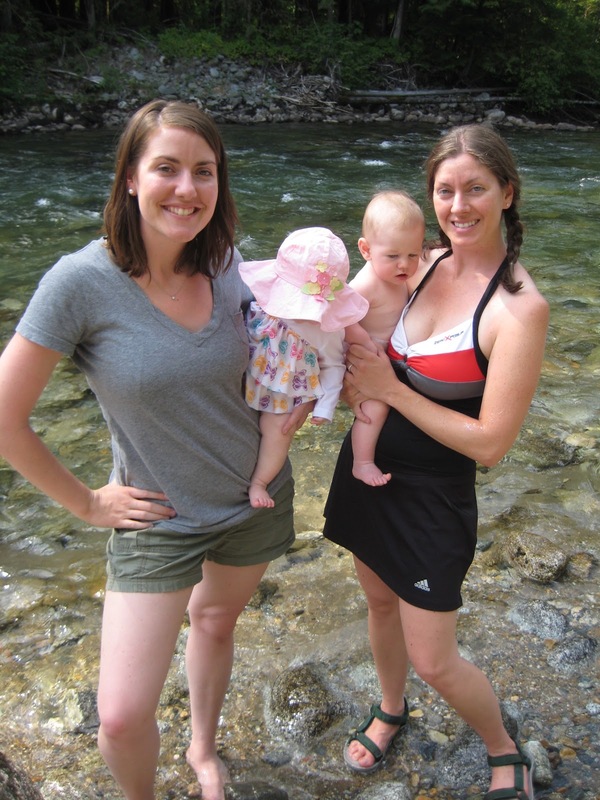 Our neighbor experienced the massive earthquake in Haiti a couple of years ago, so when Suzy overheard her telling their daughter to get outside, she promptly got Kaia up from her nap and joined them outside. It was a surreal experience. Though I felt a little dizzy and nauseous, I didn't feel fear. Isaiah 54:10 says, "Though the mountains be shaken and the hills be removed, yet my unfailing love for you will not be shaken nor my covenant of peace be removed,' says the LORD, who has compassion on you." My hope is found in Christ. I don't fear the things of this world, because to live is Christ, but to die is gain. I can't imagine not having the assurance that we have in Christ and going through difficulty. Life is trying and difficult even with Christ; I can't imagine the fear, despair, and hopelessness others must feel when difficulty comes their way. When the earth shakes, Jesus Christ is our rock, our cornerstone. When everything else in this world lets us down, God is faithful. When there is no one else to turn to, God is still patiently waiting. God has not given us a spirit of timidity or of fear, but a spirit of power, love, and discipline. And yet he tells us to cast all of our anxiety on him because he cares for us. So much has happened since we got back to Costa Rica-- physically, spiritually, and in our day-to-day schedules. Though we're incredibly busy, working hard, and the ground beneath is is shaking, Christ is faithful. He has called us here and we are overjoyed to be exactly where He wants us to be. Therefore, we praise his name! What a joy to live life for Jesus Christ, our Savior! La ruta is at the same time the most important part of FARO as well as the most intimidating component. I need to create my own route-- meaning, I have to engage 8 to 20 Costa Ricans (or native spanish speakers) and ask them to speak with me twice a week for a minimum of 15 minutes per visit. The reality is in a culture like this, the minimum is more like 30-45 minutes. Time means everything here. Did you catch the intimidating part? I need to approach 8 - 20 people. Strangers. People who speak a different language than I do and have no idea who I am. And I have to speak their language to them to ask if they'll help me out. A stranger... who talks like a child in their language. I'd say that I'm a people person... but can't you just feel that knot in your stomach that forms when you have to do something that is out of your comfort zone? You know it's good for you. You know how much it will help you. But what if the person behind that door doesn't want to buy your holiday wrapping paper? Or your girl scout cookies? Or those candy bars for your sports team? Tomorrow starts the second week of classes for this trimester. It's also the first week that I'll have to go out and walk my route, engaging with all of these Costa Ricans individually. I'll likely be spending 8+ hours talking with Costa Ricans this week. I'm both scared and incredibly excited all at the same time. I'll be planning out what topic to talk about with these people each time I see them-- so there will be a level of direction in the conversations. But I'm curious to see where some of them will lead. Please pray that God will use the little, broken spanish that I know to connect with these people I'll be investing in over the next 3 1/2 months. And if you're wondering about these 8 - 20 people, and when I have to go find them; that's what I've been doing since we got back. I'm just a couple of people away in terms of those who have committed to allowing me to talk with them on a weekly basis. And I definitely paced back and forth outside (nervously) for a while before talking to the first person... but it got a lot easier after that. Blessings to you and your family as we enter another week in the name of Christ, our Savior! This past weekend we loaded into two vehicles and drove toward the mountains with the Baldwin family. 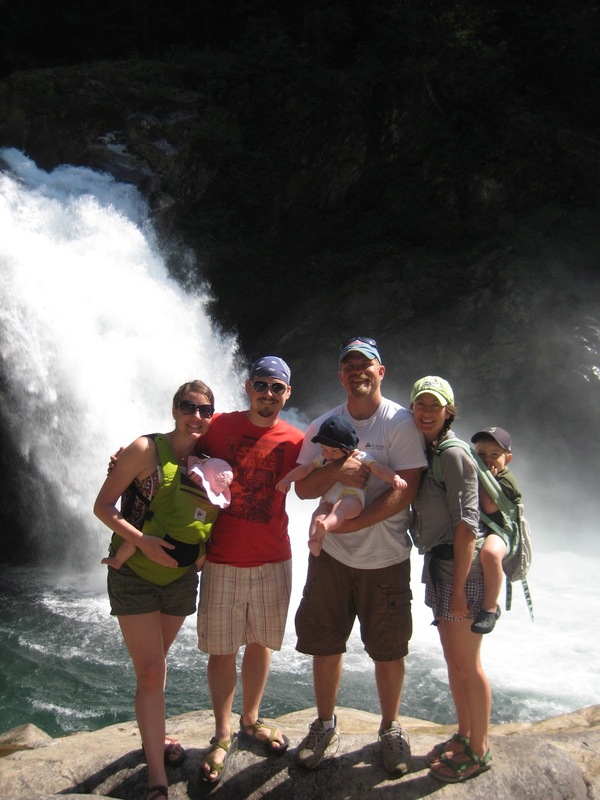 My best friend from college, Luke, married Hannah, and they have two sons: Jed (2) and Barrett (15 days younger than Kaia). Luke and I drove in his truck while Suzy rode in the car with Hannah and the three little ones. We arrived in the Snoqualmie - Mt. Baker National Forest after a beautiful drive filled with lively conversation. We found a great little spot that was a bit more isolated than the others. There was a river just down the way from us, and a big 'ol waterfall a short drive up the road which we explored one afternoon. I love camping. If there's one thing I regret from time to time, it's that we don't get out and go camping more often every year. There's something so therapeutic and restful about getting away from city life, busyness, electronics, and modern conveniences. There are so many things I love about camping: Sleeping outside and breathing in the crisp, natural outdoor air. Trees all around me. The lack of man-made sound. The lack of an agenda or obligations. Making fires. Sitting around them and staring at the flames. S'mores. Having deep, meaningful conversations while sitting around fires. Hiking. Exploring the beauty of God's creation. Feeling the flow of water on my body. Being dirty, and not minding. Taking in the amazing details of our surroundings. Being still. I think it's a natural thing when we step into the simplicity of God's creation that it's easier to view and understand life in simpler terms. I think of theology in the same sort of way. Because really, nature isn't so simple. There are so many tiny, complex intricate things that comprise it when you look closely. And theology, too, certainly has a lot of detailed, complex intricacies. But the beauty of it, in my opinion, is that theology always kind of circles back on itself and brings us to the simple, central message of the Gospel: we are broken, we need a savior, and Christ died to save us and be that savior. Nature has the same effect on me: I'm calmed in the beauty and simplicity, and then begin to notice all of the amazing, impossible-to-understand details; which eventually brings me back to the joy of the simplicity of my surroundings. And what a great environment to ponder and talk of deep, spiritual things, right? So... we enjoyed ourselves. 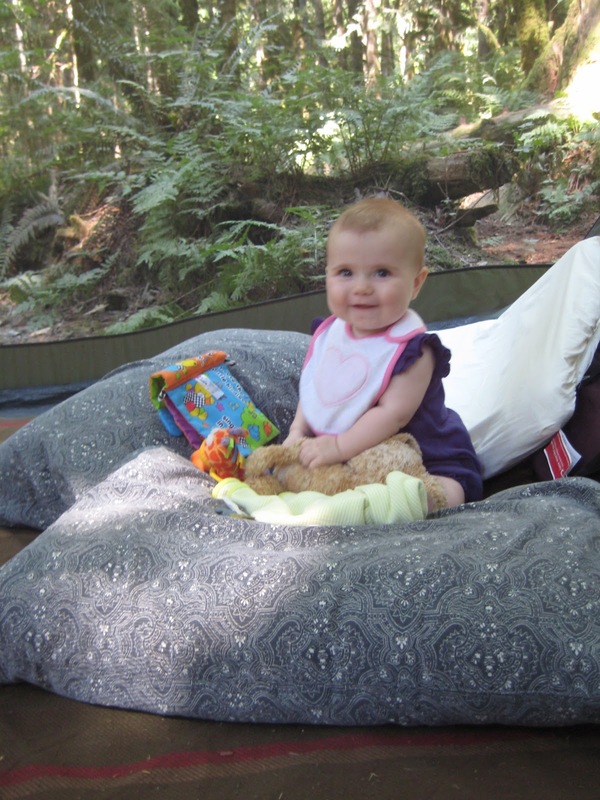 And it was Kaia's first camping trip, too. She was a champ. We all had an amazing time. If you haven't been camping in a while-- or ever-- I strongly encourage you to prioritize it. God has created a pretty amazing world. I think we forget that sometimes while enjoying the world man has created. And that is why we love camping. Kaia enjoying the great outdoors! In 12 hours from now we'll be leaving our apartment here in Costa Rica for the next 19 days. We'll be boarding a plane to take us to Seattle, Washington. It's hard to believe this time has already arrived. It's even harder to believe that this will be our last visit to the States (potentially) for the next 2 years. We just finished our last week of classes for the trimester. There are a lot of different emotions and thoughts that have been running through my head. For example: This time is going by so quickly. I can't believe we've already been here this long. What will next trimester end up looking like? Will I be equipped in spanish well enough after just one more trimester? It's also a big shift as many singles, couples, and families have graduated and won't be around next trimester. We've also got 29 new families coming to begin at the language school starting in September. The campus will look quite a bit different. I asked one of the graduates after the ceremony on Friday how he felt about being done here and moving on to Peru. He said that it wasn't all that strange. It would be hard for him to say goodbye to some of the Costa Ricans he had befriended, attended church with, discipled, and shared life with. It was unlikely he would ever see them again. But he commented that as missionaries, we're always traveling. We may run into one another again. We may not. Either way, it simply felt to him like, 'it was time for all of us to get to work.' There's some sadness, some excitement, some apprehension-- but this is what we've all been called to, and now it's time to move on to the next step in the journey. 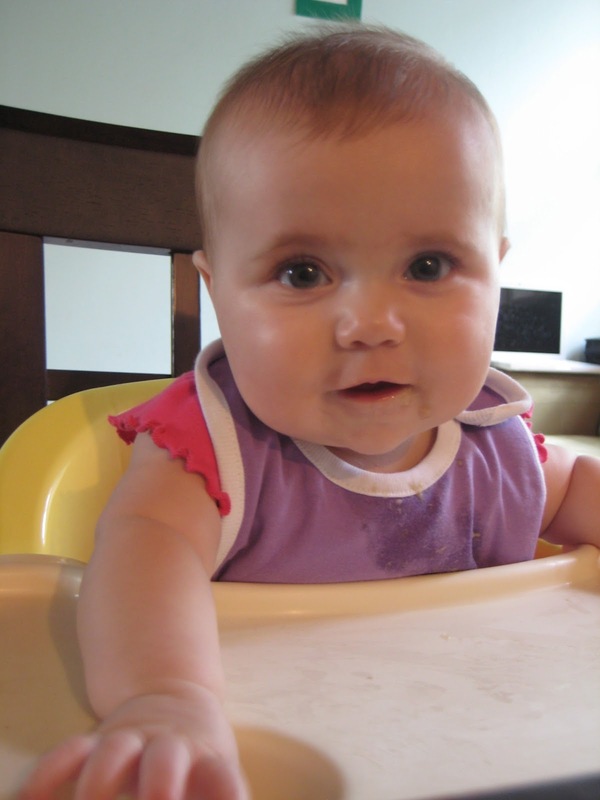 In terms of news about us, we've been amazed at how much Kaia has been developing over these past couple of weeks! Last Monday we introduced her to food other than breast milk for the first time! She has now experienced Costa Rican bananas and avocados. She seems to prefer bananas. She also finally conquered the 'roll over from stomach to back' trick a little over a week ago. It seems most babies do that before having the ability to sit upright on their own... but she's doing things in the order she prefers! We're just excited to see her connecting the dots and developing new skills and more personality day by day! To wrap things up, we're really looking forward to some R & R. We've brought spanish workbooks, notes, and a little homework with us, but we're excited to take a breather, be with family, and be renewed before launching into another trimester of spanish. God is good! Thank you for your thoughts and prayers for us-- we treasure each and every one of you and are so grateful for your support of us! May God bless your week!